There are so many benefits to a theater program! We know that schools are facing challenging times financially, so we created a special license just for accredited schools grades K-9. This license includes all the ShowKit® resources, plus the right to perform the show as many times as you would like within one year. 30-minute KIDS shows range from $395 to $495. 60-minute JR. titles range from $550 to $645. Improving academic performance, building confidence and instilling creativity are just a few of the ways theater matters for students. Drama and theater teach incredibly important communication skills. But if your school doesn’t currently provide that opportunity, how do you get started? We asked a group of theater-loving teachers for their best advice. Consider starting out with an extracurricular drama club that anyone can join. Send out flyers to students, put it on your school’s website or send it out in the school’s newsletter to get parents’ and students’ attention. Don’t hesitate to ask for volunteers. “Send a letter or email home asking for parents who have any experience with theater,” suggests Oregon teacher Cathi McIver. You may discover that you have parents or colleagues who can work magic behind the scenes, supporting your production by helping students build scenery, run the lights, design programs, and find or make costumes. “Parents are your greatest asset,” agrees Texas teacher Addie Brandenburg. “There will be parents who will love to help out finding set pieces, helping with costumes and bringing the big tools to make sets.” Be sure to share your prop and costume list with families. There will likely be many items you can borrow rather than buy. 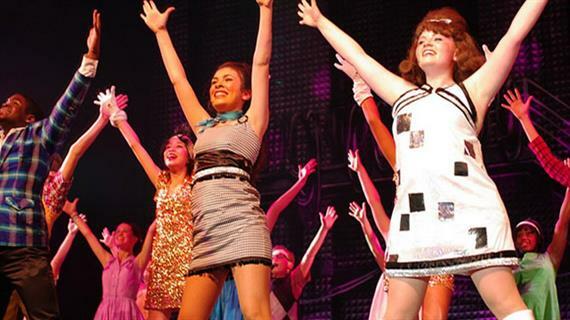 Consider a Broadway Junior Show Kit. Sure you can start with a bake sale. But you might also be able to get a grant. The Children’s Theatre Foundation offers grants, as do regional arts councils and a number of corporate foundations. Try outside-the-box fundraising ideas. Hold a raffle. Have a stage-door reception after each performance with sweets for sale. Theater isn’t just for the few kids who love to be onstage. There are many behind-the-scenes roles to play and jobs to do, from set construction to front-of-house responsibilities. The more students involved in the production, the more it will generate excitement and build community at your school. “Last year, we did Willy Wonka JR and we involved every kid in the whole school—as either an Oompa Loompa, stage crew, actor, ticket taker, etc.,” shared Pennsylvania teacher Lauren Boyer. You may not be ready for a whole school show right off the bat, but keeping the door open to any student who wants to participate will go a long way to making your production a community builder and the highlight of your students’ year as well as your own! This is the second article in a six-blog series on Theatre in the Classroom sponsored by Music Theatre International, the creators of Broadway Junior 30- and 60-minute musicals for young performers. Learn more at broadwayjr.com.